Raine PR: Steelie Bashment, Brooklyn's signature Caribbean entertainment entreprenuer, has once again joined forces with Reggae industry powerhouse Johnny Wonder and Hapilos Entertainment, to bring New York's music lovers something brand new from the Caribbean. 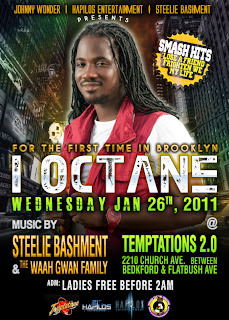 Roots Reggae sensation I-Octane will perform for the first time ever in Brooklyn, this Wednesday, January 26th, at Steelie Bashment's weekly Waah Gwan Wednesday event at Club Temptations 2.0. I-Octane, known for the break-out hits "Lose A Friend," "My Life," and "Puff It," has garnered significant recognition in Jamaica and has been awarded Stone Love's 2010 Culture Artist of the Year, and the Jamaica Observer's 2010 Male Singer of the Year. His performance at Waah Gwaan Wednesday is part of a promotional tour of New York City, which will serve as a springboard for his two-month My Life tour, which will hit the United States, Canada, and Europe later this month. Held at Club Temptations 2.0 in Flatbush, the heart of Brooklyn's Caribbean community, Waah Gwaan Wednesday is the borough's longstanding weekly celebration, and has become a the hangout spot for local soundsystems, entertainers, and music industry executives. Special guests djs and performers that have graced the Waah Gwaan Wednesday stage include New York's Hot 97 djs Cipha Sounds and Mister Cee, Tony Matterhorn, Mighty Crown, Copper Shot, Serani, Gyptian, Baby Cham, and many more. "In 2011, we are really trying to bring cutting edge talent - artists, djs, soundsystems, dancers, etc... - to Waah Gwaan Wednesdays," states Steelie Bashment. "I-Octane has becomevery popular on the local scene, and we are happy to give him the opprtunity to perform for his overseas fans in New York." For tickets and more information to Waah Gwaan Wednesday featuring I-Octane this Wednesday, January 26th, contact Bashment Karib Media at 347-770-8036 begin_of_the_skype_highlighting 347-770-8036 end_of_the_skype_highlighting. For media requests, contact RAINE PR at 347-492-3977 begin_of_the_skype_highlighting 347-492-3977 end_of_the_skype_highlighting or media@rainepr.com.